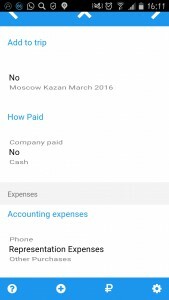 Avansovka, an expense reporting tool from Russia and for Russia has a totally flexible and intuitive input page for expenses. Fun to work with and easy to manage. Finally it is fun to manage and control your expense reporting in Russia. Just take a look at the video to get an impression. Currently only in English, in a short while it will also be in German and Russian. And from there more languages. All data in its initial version is on your mobile, and it will be kept there. Your data. Your privacy. Currency The first Magic Wheel. Select the currency of the expenese here Not a must field. 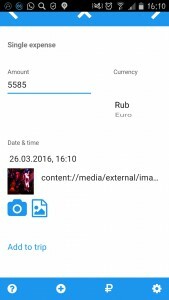 Any currency can be set up in the set up pages. Total flexibility there. Date& Time and picture Take the picture of the expense record to share with your Accountant or Assistant Take a picture of the expense or use a picture from the gallery function. Also possible to add multiple pictures. Date and time is the time when docmented. If other time to be used date and time can be changed. Date and Time becomes very important for the trip function tool sorting all your expenses in correct order against a set up trip. Add to Trip You can add any expense to a trip which you programmed. When added then all expenses are sorted inside the trip function. Either add the expense to a business trip or not. If you add the expense to the business trip then it will be sorted by the business trip function. To program the business trip go to the main sheet (+) and select business trip. How Paid The Magic Wheel how the was the expense paid documentation for the accountant or assistant The magic wheel can be flexible programmed in the the setup sections. Any combination of credit cards and other payment methodes can be documented here. And most important - here the assistant or accountant gets the information that you like to have your money back from the company!! Accounting Expense The Magic Wheel listing the different accounting expenses if you like to enter them. In the Magic Wheel the accounting expenses can be changed in the settings page. If you do not want to enter the accounting expense just select not selected. If accounting expenses are not vital for you, switch off the sheet accounting expenses. Total flexibility for the user - by design - Avansovka. Business Expense The Magic Wheel for the business expenses. Select the type of business expense here. The Magic Wheel for the business expense. Easy input. Total flexibility as you can change the type of business expenses in the setups. And if you do not want to enter the busieness expense then just select "not selected" or just switch of the tool totally. Project Expense The Magic Wheel for the Project Expenses. Select the project the expense is for if project view is vital for you. Select here in the Magic Wheel the Project Expense if you like to add the expense to a project. The easier to monitor the project related costs, clarify the refundability by a client of an expense incurred etc. Total flexibility in the Magic Wheel. And you can naturally also select "not selected" or delete the entry function fully. Microphone Well, if you prefer to speak instead of writting and comments. Here is your chance. Just add a voice message to any expense. Voice message to each expense is an optional function. Save Just save the data. Then you can process and send it later. Press save and data is filed in the system for later processing and sending. Thus you can batch send your single expenses later on instead of stepwise. Send expense Send the expense data you just generated Here you send the expense data directly after you have generated it. Send expense selections Choices Preview or Send report. Once pressed send expense you have the choice to preview report or to send it. If previewed then next you can send it (arrow function). If you send it currently only the email integration works. Later more will be added to the app. Send your expense report as email. As you see a totally flexible tool. Options – on you, the user decides what is needed and improves his expense reporting in Russia. Avansovka, the most flexible expense reporting tool by design.